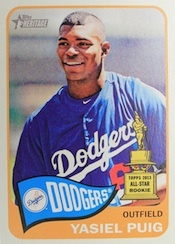 2014 Topps Heritage Baseball heads back to the year 1965. Traditionally one of the most popular sets of the year, particularly among set builders, the release arrives with plenty of nostalgia, both in how it looks and in the content. 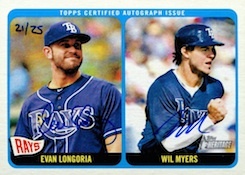 As with past years, hobby boxes come with one autograph or memorabilia card. 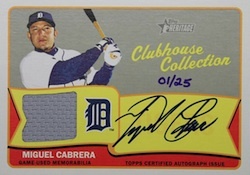 The 2014 Topps Heritage Baseball base set has a total of 500 cards, the final 75 of which are short prints. The design is inspired by 1965 Topps Baseball, which is recognizable for the team pennant at the bottom of the card. Base set variations fall under four categories. 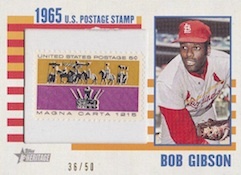 Sticking with tradition are "error" card variations that recreate mistakes and quirks that were originally made in the 1965 set. Others include Throwback Uniform Variations, Action Image Variations and Logo Variations. The base set has a handful of parallels as well. 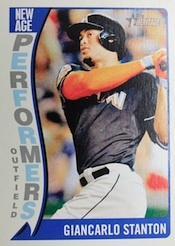 Similar to the Venezuelan cards in 2013 Topps Heritage Baseball are Black Backs. Mini Base cards come numbered to 100. Chrome parallels, long a brand staple, return. These also have Refractor, Black-Bordered (#/65) and hobby-exclusive Gold-Bordered (#/5) cards. 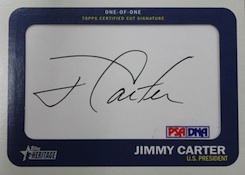 Real One Autographs return with on-card signatures from current players and retired stars. Red ink Real One Special Edition autographs are numbered to 65. Only in hobby packs, collectors can also look for Real One Dual (#/25) and Triple (#/5) Autographs. Signed cards can also be found with Flashback Autographed Relics (#/25) and one-of-one 1965 Cut Signatures. Clubhouse Collection is the main place to find relic memorabilia cards. 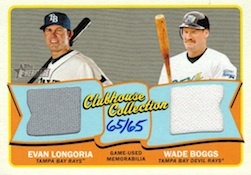 The set includes bat and uniform swatches from current players. A Gold parallel is numbered to 99. Clubhouse Collection Dual Relics (#/65) match a veteran with a 1965 standout from the same franchise. Other Clubhouse Collection cards include Triple Relics (#/25), Quad Relic (#/10), Autographed Relics (#/25) and Dual Autograph Relics (#/10). 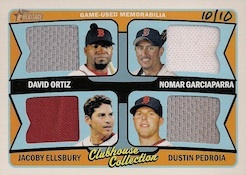 One-of-one Book Cards come with a jumbo patch, bat plate or bat knob. Other relics come with things straight out of 1965. 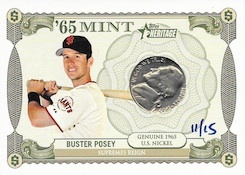 '65 Mint cards come with a 1965 coin embedded in them. Available only in hobby packs, they come in four tiers: Nickel (#/15), Dime (#/10), Quarter (#/5) and JFK Silver Half Dollar (1/1). The checklist includes a roster of current and past players. 1965 U.S. Postage Stamp Relics (#/50) are similar except they use a 1965 stamp instead of a coin. 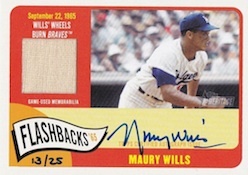 1965 Topps Hot Iron Transfers return as buybacks. 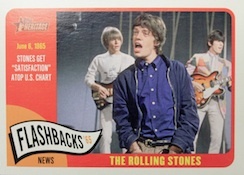 Following the success of the Beatles buybacks in 2013, three entertainment products are inserted in 2014 Topps Heritage Baseball as buybacks as well: 1965 Topps Gilligan's Island, 1965 Topps King Kong and 1965 Flash Gordon. All buybacks are original cards with a foil stamp. 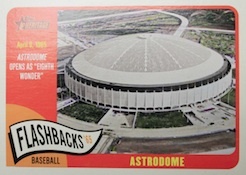 Several basic insert sets return including New Age Performers, Then and Now, Baseball Flashbacks and News Flashbacks. 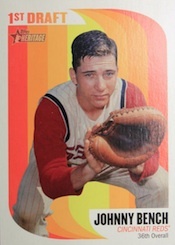 1965 Topps Embossed is based on the distinct premiums released five decades earlier. The set has both current players and American presidents. 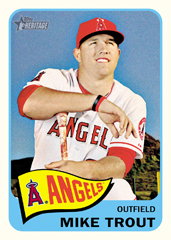 Also new in 2014 Topps Heritage Baseball are 1st Draft Cards, which commemorate the first MLB draft. Hobby boxes come with one of three different box loaders. 1965 Ad Panels feature three players. 1965 Topps Originals are stamped buybacks. 1965 Oversized Baseball Players cards are based on 1965 Topps Presidents and Famous Americans. Insert versions have a print run of 50. There are also Relics (#/25) and Autographs (#/10). 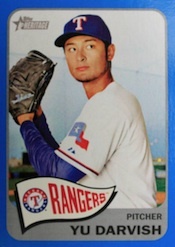 2014 Topps Heritage Baseball also has a randomly inserted redemption good for a complete set of 1965 Topps Baseball. Click here for our detailed variations guide. 20 cards. Inserted 1:3,175 hobby packs. Click here for our detailed variations guide. 25 cards. Inserted 1:23 hobby packs. Click here for our detailed variations guide. 25 cards. Inserted 1:135 hobby packs. Click here for our detailed variations guide. 100 cards. #/999. Inserted 1:14 hobby packs. 20 cards. Inserted 1:80,000 hobby packs. 4 cards. Inserted 1:12 hobby packs. 15 cards. Inserted 1:14,667 hobby packs. 16 cards. Inserted 1:1,185 hobby packs. 25 cards. Inserted 1:65,000 hobby packs. 40 cards. Inserted 1:35 hobby packs. PARALLEL CARDS: Gold #/99 - inserted 1:365 packs. 5 cards. Inserted 1:4,451 hobby packs. 5 cards. Inserted 1:11,650 hobby packs. 5 cards. Inserted 1:28,930 hobby packs. 10 cards. Inserted 1:5,965 hobby packs. 5 cards. Inserted 1:16,864 hobby packs. 56 cards. Inserted 1:141 hobby packs. Keith Olbermann autographs inserted 1:15,000 hobby packs. PARALLEL CARDS: Special Edition (Red Ink) #/65 - inserted 1:372 hobby packs. 10 cards. Inserted 1:3,386 hobby packs. 5 cards. Inserted 1:33,728 hobby packs. 20 cards. Limited to 50 copies per card. Inserted 1:800,000 hobby packs. These are presumably cards from the set released in the UK under the A&BC name. Good: Old-school look and feel, fun from a set-building perspective, good attention to detail. Bad: If hits are your thing, chances are slim of landing something great, variation confusion. The Bottom Line: Heritage is about mashing up the past and the present. 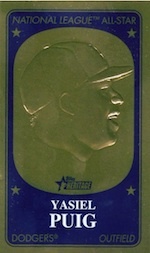 Since hitting it big in 2001, it has become one of the cornerstone releases on the hobby year. It’s one of the few remaining products that set builders gravitate towards, thanks in large part to its overall simplicity, continuity and sense of detail. For those who like the old school, particularly 1965 Topps, 2014 Topps Heritage sticks with what works. At times, it feels a little too old fashioned, especially in the photo department. But it’s tough not to appreciate at least some of the many angles that exist within the product. Like past Heritage sets, the design recreates a set from the past. We’re up to 1965, which is one of the nicer Topps sets of the decade. The flags and rounded corners make the base fronts distinct. The portrait images are often bland and murky, though. I like that the photos are different from most every other set, but spread out over such a huge set, it can get a little boring. For me, the real nostalgia is on the card backs. Old-school fonts, comics and plenty of information all come together very nicely. The crisp of the black ink also helps their readability. Inserts do a nice job of fitting in with the overall look and feel of the set. In particular, the funky backgrounds of the 1965 Draft cards stand out. I understand the Chrome cards have lots of fans, but they seem out of place to me. The couple that I got just didn’t work with the dark photos. The Refractors have added pop though. It’s also worth commending the overall lack of autograph stickers. Heritage is a bit of a strange beast. It’s the one product where it seems that a lack of big-name autographs isn’t frowned upon. That’s because the base set is the focus. And in that regard, it walks the perfect balance of being challenging and being attainable. It works because there’s enough going on to make collectors want to buy more. The base set is decent, clocking in at 500 cards. Even if they’re not often my thing, I see the place for variations in a product like this. That said, there are too many of them that don’t add much. The logo variations in particular are so insignificant that the product could easily do without them. Also, when base cards carry the theme of a variation, it only adds confusion. Adam Eaton is a perfect example in this set. He’s got the same jersey as the Chris Sale throwback, but it’s the common. It’s easy to understand why a lot of collectors were confused. Autographs focus on hard-signed cards. This is another major plus and part of what the brand is known for. Granted, a lot of the players are from the 1960s and many of today’s collectors might not readily recognize the names. But that’s okay here because it’s about history and building something. This is the one area where Heritage has long been dicey, at least from a strictly monetary perspective. Boxes have just one autograph or memorabilia card per box. Not only that, but the majority are of the plain relic variety. Big hits are around, but the average buyer shouldn’t go in expecting one. There are other places to find value, such as the base set short prints and tons of variations. But by and large, this is a product geared at those who love to collect in a more traditional sense — in a way that involves lists, trading, scouring through common boxes and studying stats on the back. Personally, I’ve never been a big-time Heritage collector. But that doesn’t mean I don’t respect it’s place. For me, I don’t connect on the same nostalgia level as I’m a little young to connect with the years and nuances that make it what it is. In a few years, it’ll be a different story. What’s great about Heritage is that it doesn’t have any flash. It’s pretty simple. It’s old-fashioned. If you’re all about rarity and cutting to the chase, move on. But if you want to take some time, build a set and take it old-school, there aren’t many products like this out there. It’s not perfect. The photos were drab for me. 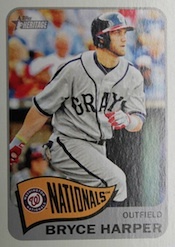 And a lot of the variations are just frustrating (not nearly as much as the tough-to-spot Sparkles in 2014 Topps Series 1). But the other side of me is always happy to rip, sort and study. Can’t wait for this set to debut! looking forward to this product. will this be the pricepoint when it is released? Looks to be very much in line with other years. you might have stuffed an extra zero in there? ooo that’s a price for a case.. DOH! Will never buy a short printed set! This was never fun in the old days. I can’t believe people buy this product! i have my calendar marked for march 5th. i can’t wait to build this set. Can’t wait for this.. And releases on my birthday! Couldn’t be better. Would have rated 3 1/2. Love product. Hate reprint of same card with a red,blue yellow,black or purple border. Why not different card for chrome set also. Especially the chrome cards. 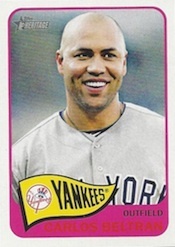 4- This design by Topps was the first I got a Mickey Mantle card with my boy friend Greg Boatwright. I LIKED THE FIRST HERITAGE PRODUCTS. THE PROBLEM NOW IS THIS IS NOT A PARALELL OF 1965 SET. THERE ARE NO TEAM CARDS FOR ONE THING. I DON’T KNOW WHY TOPPS HAS TO HAVE SO MANY VARIATIONS. I CAN LIVE WITH THE SHORT PRINTS BUT IT SEEMS TO ME TOPPS HAS GONE WAY OVER BOARD WITH THE REST OF WHAT AT ONE TIME WAS A FUN SET TO BUILD. 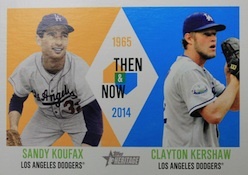 SADLY HERITAGE HAS WENT FROM A 5 STAR TO A 2 STAR PRODUCT TRY TO MIMIC THE 1966 TOPPS HERITAGE IN THERE 2015 SET. 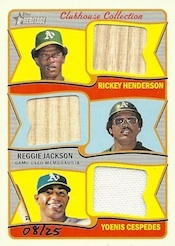 I love Heritage but agree I wish they had fewer parallels and better mimic of the 1965 set. Does anyone know what the 1965 Giants box toppers are? Is there any provenance from 1965 or are these just supposed to be box toppers that use the “embossed” look? Jimmy Carter? Keith Olberman?! Can we find anymore uber liberal people to sign “Baseball cards”? Totally un-necessary. My favorite vintage Topps design. Can’t wait for the Minor League version to drop. Rush Limbaugh doesnt fit on a baseball card. I suppose they could have made him a case-loader autograph. Does this mean I will finally get my redemptions from the last two years ? 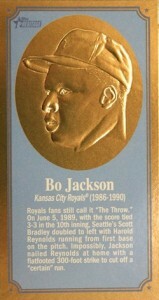 The concept of heritage is a good one but topps has so little credibility anymore. Still waiting for touched by greatness, unopened 1964 pack , Axl rose and just about anything else that was featuredin your magazine as a highlight. It’s too bad the historical nature of this product each year should be a time to celebrate collecting, not renew frustrations with how pathetic it has become . Pretty good product. Opened one box that contained neither an autograph, nor a relic. How often does that happen? Also, in terms of variation, why is the Adam Eaton card (#302) not a variation when he is wearing an 80’s White Sox uniform, when Chris Sale (#471) is wearing the same era uniform? Kevin � Looks like Eaton is a base card. I too opened a hobby box that did not contain a “hit”. This shouldn’t happen when they advertise on the box, contains one autograph or relic card. Peter � Contact Topps. If they’re guaranteed, they should replace. I always get excited about Heritage, then I open a box. I love the looks of the cards. I even love the non baseball related history lessons. I find it too distracting to try and keep up with the many short print variations. I have a Chris Carter card #39. The pennanat reads “Houston” in stead of “Astros”. Does anyone know if this is an error or not? Still no Heritage at my local Targets. Is Target not carrying them this year? One of our Walmarts had a few jumbo packs, but that’s it. What’s up in Western NY? I really wish they didn’t stamp the buybacks. whats the point? I read the March 16 comment of Mark. Titanic the way they are going. Love this years Heritage! I need to get me another box somehow! I got one hobby and picked up a blaster at Walmart. Nothing to mention in Walmarts blastet BUT in the hobby box I pulled a rare sp black refractor of DEREK JETER! Numbered to only 65! Thanks Ryan for the great work you guys do here for the collector with all the checklists and variations list’s! You guys rule! That;s why your my #1 source to go to daily! Heritage is just one of the last great semi-simple sets to build at many levels like, base, base+SP’s+SubSets and few other good harder to build goodies like the Mini’s. Good stuff. 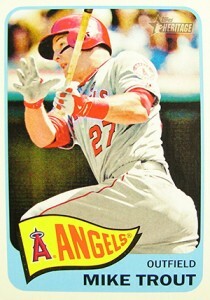 They could put a little more effort into increasing quantity of quality on card Auto’s. Good Stuff. Have torn through 4 cases already. Attended a midnight release at the local card shop. Pulled a gold Bryce Harper. The product is great. Love the thick card stock and the the vintage feel of the cards. Wish the autos fell a little better. Averaged about 3 per 12 box case. Yes indeed….$5 off coupon for a blaster box from Target and the results are RIDIC!!!! Guess the packaging crew slipped a bit – AND I THANK YOU! 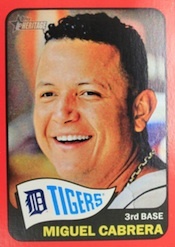 LOVE THIS VINTAGE FEEL….bringing back fond memories of when my younger brother (Nathan: RIP) and I collected together *swapping baseball cards and the gum out of the packs! sonny dickson � I’ve never had an issue with having cards like that replaced. It’d definitely be worth your while to write them a letter and send the cards back. Finally picked up 5 blasters at target. 1 refractor, 1 chrome, 1 relic, 5 red boarder, 3 then & now, 1 mini & 0 high number. So after being almost a month late to retail, the lack of high number cards turned me off this year. Only thing that pulled me in was the $5 coupons but hopefully I don’t make the same mistake next year. I enjoyed the card design and am pleased they made photo variations a little easier to get but how common the inserts are per pack and their lack of diversity has created stacks of duplicates. 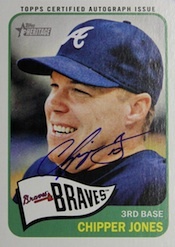 After buying 10 boxes, got 2 auto’s, the 10th box was a hot box, with 24 purple refractors, pulled an auto of Chipper Jones, best hit ever from a box of this stuff. Let’s put it this way, Topps screws collectors that buy blasters. Some collectors do not have the luxury of a local card shop so they resort to Walmart and such. Online is an option but what supplier is trust worthy? Bought roughly a 5000 ct of Heritage. Not ONE auto? 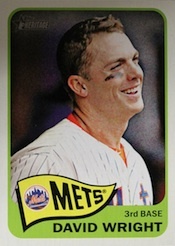 This is typical of most Topps products. Heritage and Chrome are my BB focus for most years. Probably switching to eBay to just buy my sets. BIG DROP OFF from last years product. in 2013 you could pick blindly at a pack of cards and get either an auto/relic/Mini/ or Bazooka. I went through 8 GIANT gravity boxes and over 200 rack packs and FOUND ZERO autographs or minis or bakookas. Topps can’t expect us to throw money away at worthless commons. But since the 2013 was so fantastic they were hoping to fool us into thinking 2014 would be as comparable but it wasn’t. 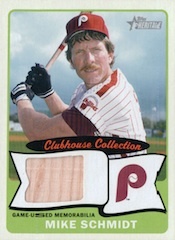 1) why wasn’t the purple refractors noted on the wax pack? 2) i also purchased a box with a purple in each wax pack. Dean Leiby � Sometimes things are intended to be a surprise and aren’t on the wrapper. I believe every case was a “Purple” hot box like yours. This product is not a 1 star because it did bring back a lot of nostalgia. After opening a blaster box and some jumbo packs, I was reminded of the poor quality cardboard, off center cut cards, and terrible picture quality of Topps of the late 70’s and 80’s when I was young. These reasons are why I was loyal to Donruss, Fleer and later Upper Deck when the free market was allowed to work in the 80’s. These cards are definitely from the past; and that isn’t a good thing given the ridiculously high price of these cards. If they were half the price, it would be a different story. 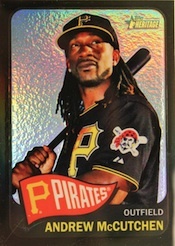 Haven’t looked at the product in person, but that black McCutchen Chrome card looks FANTASTIC on screen.